BufferApp enables you to queue up posts for social media websites like Facebook (business or personal pages), multiple Twitter accounts, and LinkedIn (other social networks are in the works) and launch them at prescribed times. It optimizes your time because updates can be queued from any browser or mobile device. When you find a story to share, you post it to BufferApp via apps or extensions. You can also edit or change the order of the updates on any device. BufferApp (also referred to as Buffer) does a fantastic job of managing the basics of sharing articles and quotes in your Twitter account. You can also use the program to buffer (schedule) reTweets and Facebook shares to Twitter. You set the post’s timing patterns and frequency from your dashboard. BufferApp is free to try, and $10 a month to subscribe. By viewing your Buffer account’s analytics page, you can see how many folks clicked or reTweeted your post. You can also follow back such users, and comment (thank them) right from the analytics page. After you have signed up for Buffer, download the extension for your browser. To get the mobile app (you can use it on your tablet), visit your App store. Buffer buttons now appear in your browser wherever you need them, next to the Tweet and reTweet buttons on Twitter and the Facebook share and post buttons. When you find a particularly interesting story or quote while browsing the web — or in a newsreader — you can buffer it from your browser and set up a post. 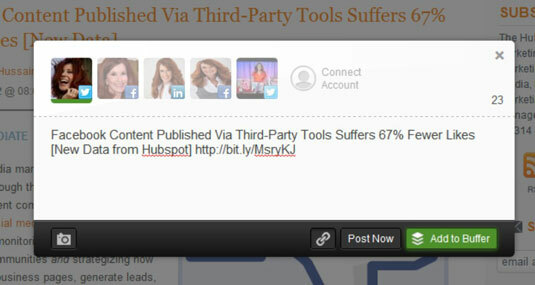 On your mobile device, Buffer appears as an option when you click to share. One click adds this story to your scheduled list. When engaging in social media, you have to be there and participate in the conversation, so the idea of scheduling every post is soulless. Space out your Tweets with a reasonable amount of time to give your followers an opportunity to see your updates. If you barrage them with post after post, you will have more unfollows than follows. Schedule interesting articles and quotes that your followers will find worthwhile. When it comes to self-promotion, don’t send one post after another. Keep your audience engaged; don’t broadcast to them. Balance your schedule. Don’t use Buffer for every update. Post time-sensitive material as it happens from your mobile device or computer. Jump into the conversation and answer all @ replies manually. Thank your followers for any reTweets of your posts. Don’t sacrifice your online interaction by scheduling. Real-time communication is your ultimate goal. Remember to keep your posts social. Networking now is a world of social business and social interaction. Use BufferApp to lighten the load. You’ll be much happier in your online engagement if you do.